For this article, dvm360 interviewed Susan E. Little, DVM. Dr. Little works in the Department of Veterinary Pathobiology, Center for Veterinary Health Sciences at Oklahoma State University. She is a past president of the American Association of Veterinary Parasitologists and an expert on veterinary and human parasites and tick-borne disease agents. According to Dr. Little, human cases of Lyme disease are increasing, which means the number of infected dogs is also increasing (human cases are tracked, canine cases are not tracked in the same manner). Dr. Little says regions of the U.S. not previously endemic for Lyme disease also appear to be increasing. Human cases are coming from more counties and states than in the past. In recent years, more cases have been reported in the Great Lakes area and south along the East Coast all the way to North Carolina. However, the majority of cases remain in the Northeast and upper Midwest. Dr. Little would like veterinarians to maintain a heightened awareness that coinfection with other pathogens is common among dogs that test positive for Lyme disease. If an animal has one tick-borne disease, it very likely has others. In particular, any dog that doesn't respond to treatment for a single diagnosis should be checked for coinfection. I can personally vouch for the fact that Lyme disease is on the increase. Recently I've had an unusually high number of dogs test seropositive for Lyme antibodies at my clinic. Dogs testing positive have been exposed to the infection, but don't necessarily have the active form of the disease. The vast majority (95 percent) of dogs exposed don't get sick or show any symptoms. In order to differentiate exposure from active disease, I run a quantitative C6 assay blood test from IDEXX Laboratories. Only dogs with active infection require treatment – the rest do not. As Dr. Little points out, white-tailed deer and white-footed mice are the primary hosts and reservoirs for the infection that causes Lyme disease. 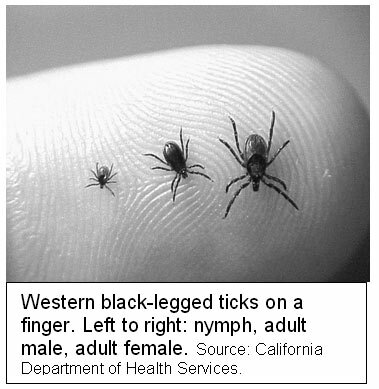 Adult black-legged ticks, also called deer ticks and Ixodes ticks, thrive with plenty of deer around. The more deer there are in an area, the more deer ticks there will be. Younger ticks go after rodents like the white-footed mouse, but other small hosts like chipmunks and shrews are prevalent in certain regions. A tick transmits the Lyme organism, a spirochete, to a dog or a person and both can become infected. Lyme disease in cats and cattle is uncommon, but horses can become infected in tick-infested areas. In humans, signs of Lyme disease are a skin rash, which often resembles a bull's eye, and flu-like symptoms including fever and lethargy. Dogs not only don't develop a telltale rash, in most cases they don't even appear sick despite having contracted an acute Lyme infection. That's why I do the C6 test whenever I have a patient testing positive for Lyme antibodies. The C6 test helps me determine whether there's active infection so I can institute treatment with the antibiotic doxycycline if necessary. Keep in mind only 5 percent of dogs with Lyme antibodies actually become sick with the above symptoms. In an even smaller percentage of pets, chronic Lyme disease can result in significant kidney problems, as well as autoimmune polyarthritis, a type of joint degeneration secondary to an undiagnosed, untreated Lyme infection. As Dr. Little points out, many dogs with active Lyme infection also have other infections. If your dog is diagnosed with active Lyme disease, your vet should run another IDEXX test, the SNAP-4Dx blood test. The SNAP-4Dx tests not only for Lyme, but also for heartworm disease, anaplasmosis, and e. canis, and is beneficial in both diagnosis and treatment. I also recommend checking for Rocky Mountain Spotted Fever if you are in an endemic area. I'm not a proponent of Lyme disease vaccines. These vaccines are bactrins, created to treat non-viral infections. Their immunization duration is short, usually around a year. Even worse, these vaccines are known to be significantly more reactive to the immune system. Sending your pet's immune system into hyper-drive can trigger a whole host of serious secondary reactions, including autoimmune disease. Further, many dog owners mistakenly believe the vaccine will somehow prevent ticks from attaching to their pet. This isn't true – you still need a tick repellent. If you live in a Lyme endemic area and use a chemical tick repellent on your pet, using the vaccine as well will give your pup a double dose of toxins and increase his risk of toxicosis, a disease resulting from poisoning. Just a few weeks ago I saw my first canine patient with Lyme disease and heartworm disease -- conditions she acquired while taking a monthly, year-round chemical heartworm preventive and a spot-on flea/tick preventive prescribed by her regular vet. This poor dog's situation is a good demonstration of the ineffectiveness of some of these drugs. It's also another warning sign parasites are growing resistant to the drugs used to prevent and eradicate them, thanks in large part to overprescribing and overuse. As I write this, veterinary drug companies are scrambling to develop the next generation of toxic chemicals that will cause more autoimmune disease and cancer in too many precious animals. And without question, pests will grow resistant to these newer, more deadly drugs as well. If you live where Lyme disease is endemic or you inadvertently wind up in a tick-infested area, check your pup for ticks twice each day. Look over his entire body, including hidden crevices like those in the ear, underneath his collar, in the webs of his feet, and underneath his tail. If you find a tick, make sure to remove it safely. Use a safe tick repellent like Natural Flea and Tick Defense. If you live in a Lyme endemic region of the U.S., your veterinarian will probably recommend you use a chemical repellent. Remember: it’s important to investigate the risks and benefits of any medication before you give it to your pet. Create strong vitality and resilience in your dog by feeding a species-appropriate diet. Parasites are attracted to weaker animals. By enhancing your pet’s vitality, you can help her avoid the ill effects of a Lyme infection or other opportunistic pathogens. Previous Article Can Birds Play Fetch? Next Article This Mosquito Borne Super-Worm is Soaring in the U.S.